NOTE: Before purchasing, check with your instructor to ensure you select the correct ISBN. Several versions of Pearson's MyLab & Mastering products exist for each title, and registrations are not transferable. To register for and use Pearson's MyLab & Mastering products, you may also need a Course ID, which your instructor will provide. Used books, rentals, and purchases made outside of Pearson If purchasing or renting from companies other than Pearson, the access codes for Pearson's MyLab & Mastering products may not be included, may be incorrect, or may be previously redeemed. Check with the seller before completing your purchase. Note: You are purchasing a standalone product. MyStatLab does not come packaged with this content. MyStatLab is not a self-paced technology and should only be purchased when required by an instructor. If you would like to purchase both the physical text and MyStatLab, search for: 9780133956504 / 0133956504Introductory Statistics Plus NEW MyStatLab with Pearson eText -- Access Card Package, 2/e We live in a data-driven world, and the goal of this text is to teach students how to access and analyze these data critically. 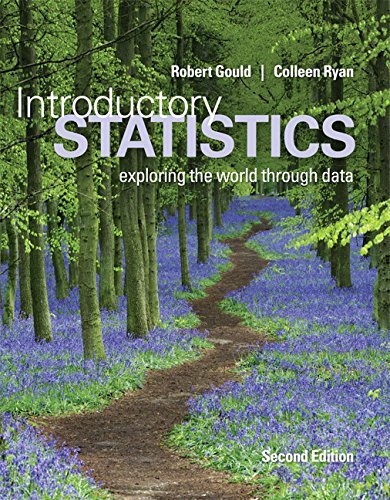 Authors Rob Gould and Colleen Ryan emphasize that learning statistics extends beyond the classroom to an essential life skill, and want students to develop a “data habit of mind.” Regardless of their math backgrounds, students will learn how to think about data and how to reason using data. With a clear, unintimidating writing style and carefully chosen pedagogy, this text makes data analysis accessible to all students.